In hospital with his beloved wife Linda by his side, on Sunday March 3rd, 2019 at age 68. Predeceased by his parents, Wilfredo and Rosa, and brothers David (Grandy), Bruno (Jennifer), and Joseph (Merici Young). 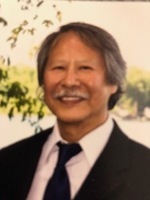 He leaves behind to mourn, his devoted wife and best friend Linda, his loving sister Carmen (John Lee), his dear brothers Santiago Ku, and Maximo Ku (Selina), as well as many nieces and nephews and their families. Simon will be fondly remembered by father and mother-in-law Raymond and Betty Vaillancourt, and Linda’s siblings, Joann Staneland, Karen (Jim Pearson), Steven (Lauren), Liza (Marc Lavigne), Paula (Jon Fried) and Marc, as well as by their children. Simon will also be greatly missed by his dear friends and by his many colleagues in the artist community. Special thanks to all for the excellent care provided during Simon’s illness. As an expression of sympathy, donations may be made to the Ottawa Hospital Foundation - "Cancer Research Genetic Trials" (www.ohfoundation.ca) , the Ottawa Humane Society (www.ottawahumane.ca),or to the charity of your choice. Friends and family are invited to visit at the St. Laurent Chapel of Hulse, Playfair and McGarry, 1200 Ogilvie Road (at Aviation Parkway), Ottawa, on Friday March 15th, from 7-9 pm and on Saturday March 16th from 9:30 am until time of service in the chapel at 11:00 am.